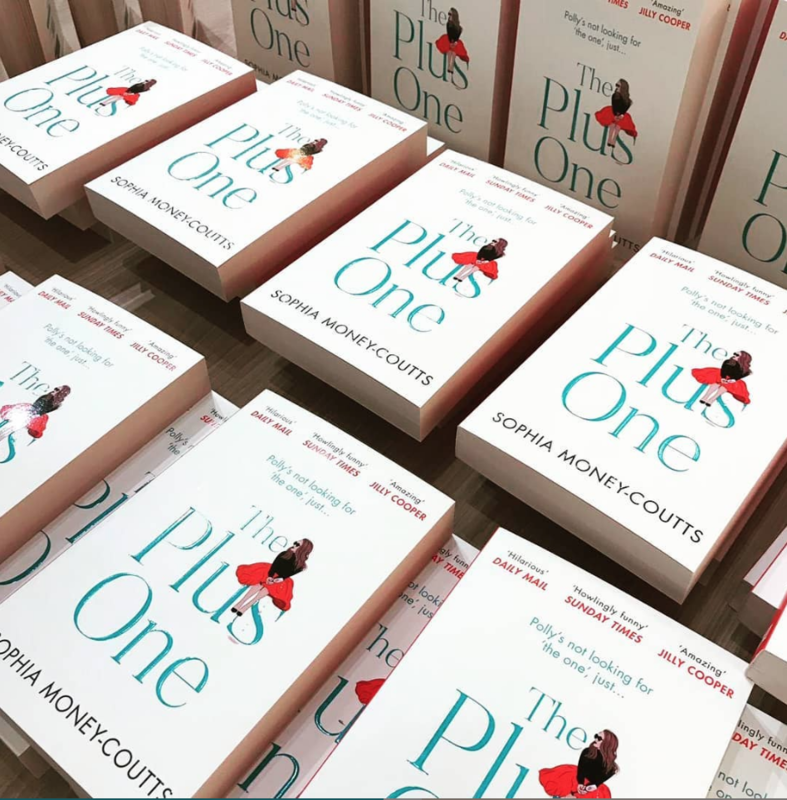 THREE DAYS to go until the paperback of The Plus One is out. Thursday, in other words. Thursday. THURSDAY. I shall be in the car driving from London to Spain with Michelle Obama for company* but if you could all go to a bookshop and buy a few copies that would be super. As part of the push for the book, I did a Q&A on Friday evening which was total heaven because I got to talk about myself and make bad jokes for an hour. Huge huge thank you to everyone who came and bought copies. Stupendously grateful. Am only sorry if I shocked anyone by discussing spurgling and the themes of my next book, but there were some v wonderful 80-somethings in the audience who didn’t look too dismayed. Perhaps I pepped up your weekend. I hope so. I have more book news which I’m *bursting* to tell you but will have to hang on for a bit which, further to my last post on here, is another intensely annoying thing to say I KNOW. Just…very very very very very very excited about it and so my sleep continues to be haphazard because am operating on 95 pc adrenalin atm, 5 pc wine. Column from yesterday below. It’s a rant against electric scooters and I happened to drive up the Fulham Palace Road towards Hammersmith yesterday behind one who not only didn’t have a helmet, but was also wearing earphones and weaving all over the place. ‘THAT’S ILLEGAL MATE,’ I wanted to shout through my window at him, but obviously didn’t because am too much of a wimp and also I sound absurd whenever I call anyone ‘mate’. No, what I mean are the electric scooters increasingly adopted by adults. I’ve seen a few grown-ups whizz along on these big toys in London and grimaced. A fully-grown man on a scooter is a ludicrous vision, like an octopus on a bicycle. But they haven’t (yet) taken over in Britain as they have in, for example, Nashville, where I was a couple of weeks ago. In Music City, everywhere I looked, electric scooters were making a nuisance of themselves: lying like cadavers outside restaurants, paused in front of shop entrances, cluttering the ‘sidewalks’ and rendering them obstacle courses for anyone in a wheelchair or with a gammy leg. As with the ‘Boris bike’ scheme in London, if you have a smartphone, you can hire one in seconds – download an app, zap a barcode on the front of the scooter with your camera and, bingo, it’s unlocked. ‘They’ve killed a couple of people in California,’ reported a glum cabbie I took from my Nashville hotel one day, as hordes of two-wheelers swarmed around us at a red light. No helmets even though they reach speeds of 20 mph. And technically they’re for those aged 18 and over, but another resident told me that they’ve become so fashionable that parents often unlock them for wheedling children. It’s not just America that’s afflicted either. I conduct a quick Twitter poll and find similar complaints from Brussels, Amsterdam, Lisbon, Zurich, Tel Aviv, Singapore, Abu Dhabi and Auckland. In Zurich and Basel they’ve recently been removed from the roads after too many accidents. A couple of weeks ago, the Parisian authorities announced new measures to regulate their escalating popularity – fines for anyone using electric scooters on pavements or for inconsiderate parking. A friend tells me she knows a plastic surgeon in Paris who’s doing a brisk trade in facial reconstruction, such is the rate of prangs on these electric bugs. Although smashed teeth, broken noses and jaws splintered on concrete kerbs are nothing compared to the head injuries of the man who died in San Diego last month after driving his scooter into a tree. My Mary Whitehouse-level of concern is because the Department of Transport is considering changing the law on electric scooters in what one civil servant has called ‘the biggest review into transport in a generation.’ Currently, the scooters are banned from both British pavements and roads, but that may alter and our cities could soon look (a bit) like Nashville: human-sized flies buzzing underfoot. I know they’re good for the environment. I understand they’d ease congestion. I appreciate that they’re a jollier mode of getting to the office than, say, the number 266 bus. I even took one across Nashville as a test and can report that they’re nippy, efficient and my hair streamed around my face as if I was in a Kate Bush video. But they will also kill people. Motorists and cyclists may loathe one another, but at least the majority of bicycles aren’t electric and their riders are vaguely more in control. And don’t even get me started on electric skateboards. How smart is your house? You might have a boot room which is pretty swank. Or a separate laundry room so you don’t have your washing machine in your kitchen (which Kirstie Allsopp thinks is ‘disgusting’). A larder is very posh indeed – ideally stacked with the remains of last weekend’s lunch, jams you’ve made yourself, 58 dusty bottles of sloe gin and a stale packet of cheese straws. But what we should all have now is a floating yoga studio. Meghan Markle has supposedly installed one at her new cottage (ahem, 10 bedrooms) in Windsor. It means a room with a sprung floor, designed specifically for Downward Dogging and other yoga poses. Rumour has it she’s going to do a Vogue shoot at the ‘cottage’ with the new babe in due course, so here’s hoping we get a snap of the studio for our own inspiration. Did you see the recent story about the European couple who ‘lost’ a £1m engagement ring? ‘Deary me,’ I thought, reading the headline. ‘Presumably Countess Olympia von Arco-Zinneberg (engaged to Prince Jean Christophe Napoleon, a descendant of the short guy) was mugged or something horrid?’ Nope, turns out the countess left her £1m bling in her bag in their unlocked car in Paris. Is that not quite dim? I berate myself for losing hair elastics and socks almost every day (where do they go? Do I eat them in my sleep? ), but even I wouldn’t be so careless as to leave a diamond the size of a blueberry in an open car.